Imperial Beach "Then & Now" brought to you by the Imperial Beach Historical Society. Celebrating Imperial Beach's 60th Anniversary. See IB's Rich History on display at the Mayor's Breakfast and the Sun and Sea Festival July 15th and 16th at the IB Pier. See IB's Rich History on display at the Mayor's Breakfast and the Sun and Sea Festival July 15th and 16th at the IB Pier. We are working to preserve Imperial Beach's Rich History. 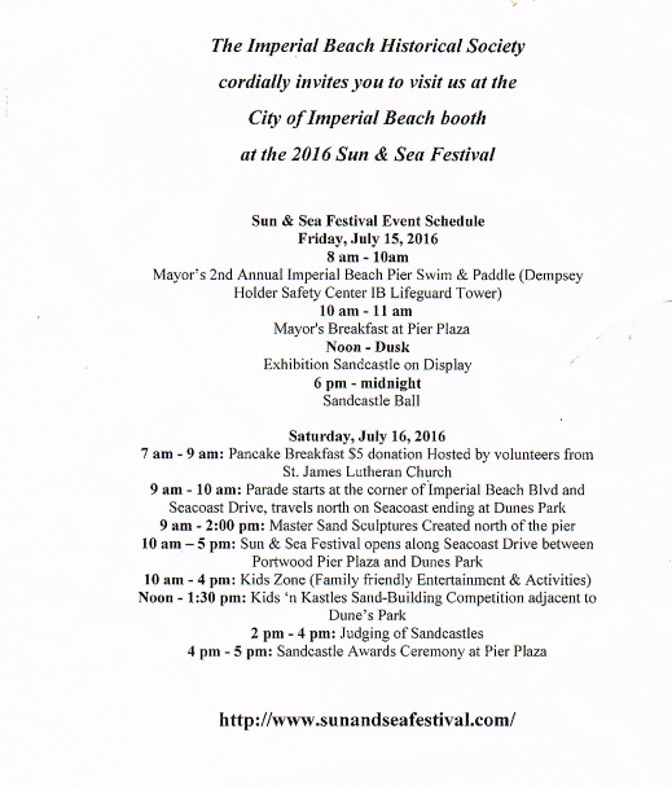 Friday and Saturday, July 15 and 16th, at the Mayor's Breakfast and the Sun and Sea Festival we will be presenting Imperial Beach's Historic Past for all of you to see. We are working hard to preserve our City's History. From Freida Adams the torch was unofficial passed to IB City Council member Lorie Bragg who has put together our group to display the City's History at the Mayor's Breakfast and at the Sun and Sea Festival. That group grew into what today is know as the Imperial Beach Historical Society (and Iconic Commission). Our group started off as the IB History Group and was formed to put together a booth for the City's 60th Anniversary Celebration taking place at the Mayor's Breakfast on Friday July 15th. Once the project got started it became clear that there was a much bigger need than to just organize and put the existing history into binders for presentation. It is clear that much of Imperial Beach's history is getting unintentionally lost or destroyed. With the passing of longtime residents of IB not only do historical possessions get thrown out because their children don't understand their historical value to the community but there is no place for them to donate them to if they do. Our older residents are valuable resources in so many way. In our case their knowledge of the past is invaluable and we need to sit down with them to record their memories as well. We now have about 20 members working on the City's 60th Anniversary Celebration. About 10 of us our also working hard on our long term goal of establishing a IB History Museum for not only the preservation of our history but to share it with all of the community. Currently we meet twice a week on Tuesdays and Thursdays at 4pm in the Community Room at the Imperial Beach City Hall. At this time we are operating on a small budget from the City of IB and generosity of our members time and financial contributions from the community. We are looking into putting together fundraisers to help sustain our organization and achieving our goals.